This fabulous picture book biography explores the life of Ida B. Wells. Born a slave in 1862 as the Civil War raged on, she was no stranger to injustice. Since she was a young girl, Ida had a mind of her own and was not afraid to express her opinion. She loved to read and write and she became a teacher and a writer, sharing her ideas about politics and religion when most women writers wrote about family life. Ida's articles gained popularity with both men and women as she spoke out against the Jim Crow laws which made segregation legal. Years before Rosa Parks sat down on that bus, Ida Wells was refused passage in a first class train car even though she had purchased a first class ticket. Rather than ride in another car, Ida got off the train. Ida's life changed when a friend of hers was lynched in Memphis. Ida began to write about lynching and to speak out against it. Her words were published in newspapers such as the Free Speech and The New York Age and eventually helped to bring an end to lynchings. Ida always signed papers Yours for Justice, Ida B. Wells. I loved the illustrations in this book. They are full of bright colors and striking images. I think the images in this book do just what great illustrations are supposed to do: they compliment the text and heighten the overall meaning of the book. 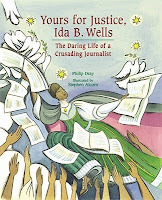 The bulk of the book concentrates on Ida's campaign against lynching, but an afterword contains additional information about Ida B. Wells's life. It includes a timeline and information about the practice of lynching. Yours for Justice, Ida. B. Wells is on the ACPL's Mock Sibert list and check out Diane Chen's review and see how she used it in her classroom. Happy Nonfiction Monday! Go check out the roundup at Picture Book of the Day!